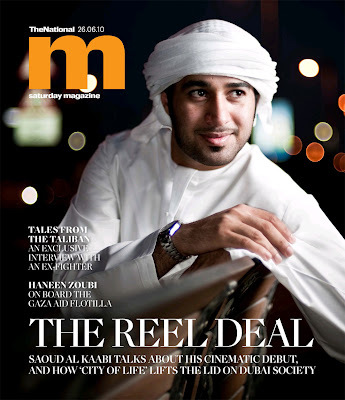 Last week, I shot with the star of Emirati film, City of Life at one of the Dubai locations that features in the film. I shot some of it with a cover in mind, but I had no idea until I saw the latest issue of M this morning! NICE. I am very happy with the cover but really wished a different image was chosen for the inside. I shot this at a classic Dubai favourite, Al Ijaza Cafeteria in Jumeirah. I planned the shoot so that it was in the evening so I could shoot from daylight, into twilight and then night. This was so I could incorporate the glowing sign of the cafe, street lights, etc. I also love shooting with wide open apertures to render blurry backgrounds and lovely out of focus points of light. Technically, all the shots were with one speedlight at fairly low power. Thankfully, I had Raja assisting me with the lighting. The cover shot is a speedlight through an umbrella placed very close to the subject's face. The speedlight was triggered by the D700's on board flash. At very wide apertures, the little trigger burst from the on-board flash actually affects the actual exposure (Which according to Nikon, it isn't supposed to!) In this case I chose to keep it because it was acting as a nice 'on-axis' fill.. other photographers would use a ring flash or a large softbox directly behind camera to do the same. (Here is Mr. David 'Strobist' Hobby's introduction to on axis fill) Happy accident that worked for me! Here is a slideshow of some of the images from the shoot. As per usual, thanks to the inimitable Mr. Clint McLean. Note: Hover mouse over slideshow to reveal arrows for manual navigation. Clicking on the slideshow will take you to a web gallery of these images so they can be viewed larger. Lets see you soon in Dubai..